For the latest book in the phenomenally successful Worst-Case Scenario Survival Handbook series, the authors have pulled out all the stops, harkening back to the core appeal that made the first book a runaway bestseller. Here are all new scenarios for living life on the very edge. Imperiled readers will learn immediate, hands-on strategies for surviving an elephant stampede, a 16-car pile-up, a mine collapse, and a nuclear attack. Discover how to take a bullet, control a runaway hot air balloon, break a gorilla’s grip, endure a Turkish prison, and free a limb from a beartrap. 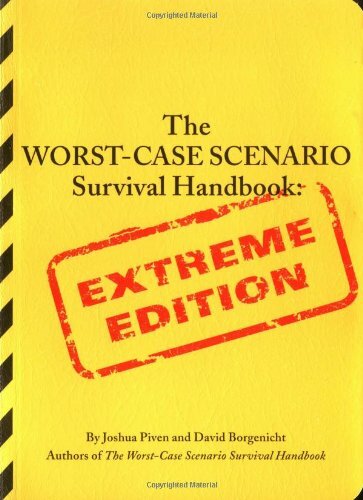 Whether stranded on an iceberg, being chased by a pack of wolves, spinning out on a motorcycle, or being buried alive, The Worst-Case Scenario Survival Handbook: Extreme Edition has all the right stuff for those times when everything goes wrong.